There are fewer and fewer people who are acquainted with old-fashioned manual labor. That’s not to say that they won’t do it, but it certainly seems like a chore for those who never have their tools out, to have to get out an entire box of every tool they own just to take care of one or two smaller tasks. This is where having an EDC tool could come in handy, which is essentially a multi-tool that is useful for everyday situations. If you only want to pull out your wallet to be able to tighten a loose bolt, cut a bit of twine, cut down a branch, or protect yourself in the wilds, you’ll want the SURVCO Tactical Credit Card. This has 21 capabilities, all on a thin piece of metal that you can slip into your wallet. It can pull up nails, act as an arrow, spear, saw, ax, tomahawk, knife, scraper, skinner, shovel, seat belt cutter, bottle opener, water valve wrench, gas valve wrench, flat head screwdriver, can fit fourth, five-sixteenths, half, three-eighths, and seven-sixteenths inch sockets, and more. 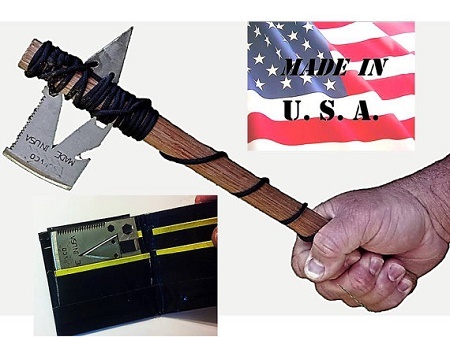 You will need to have a paracord bracelet handy to turn it into a tomahawk or spear, but if you’re looking at getting one of these, you are likely already prepared. This is made of 12 gauge 304 stainless steel, and is made by a disabled veteran. That being said, he likely knows what’s going to be practical. This is made not to rust, and while this shouldn’t need to be said, you will essentially be carrying a sharp metal object around, so do try and remember that if you go on a plane as they discourage that sort of thing. This is only going to cost you $37.69, and will likely require a bit of fiddling with to get used to as an everyday tool. Add a microSIM card ejection pin and then it’ll have a function that gets used once.